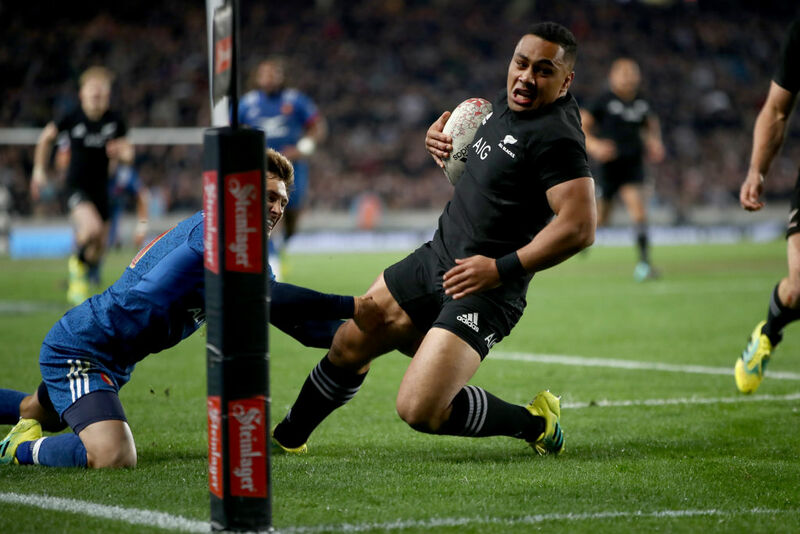 The All Blacks selectors have gone for a battering ram approach to their midfield for the second Bledisloe Cup test against the Wallabies at Eden Park on Saturday, with Ngani Laumape winning the No 12 jersey in the absence of Ryan Crotty. The hard-running and defending Laumape has been chosen ahead of the more subtle and experienced Anton Lienert-Brown, who played such an excellent supporting role for centre Jack Goodhue at ANZ Stadium in Sydney last weekend when coming on after 12 minutes following Crotty's head knock. The selectors have clearly decided Lienert-Brown's value on the reserves bench is such that they want to keep him there. It will be the 25-year-old Laumape's seventh test and only his second start. The powerfully-built Hurricanes player is likely to be used as a blunt force object against the Wallabies before Lienert-Brown, a superb broken-field runner and with the spatial awareness to match, is injected during the second half as the All Blacks attempt to up the pace. Crusaders midfielder Goodhue's quality was evident last weekend as he scored his first test try in his second international, but he and Laumape have played a combined total of eight tests so this will be one of the most inexperienced centre partnerships fielded by the All Blacks in a Bledisloe Cup test. There is only one other personnel change to the team which beat the Wallabies 38-13 in Sydney to put one hand on the Bledisloe Cup for yet another year, with Jordie Barrett starting at fullback, Waisake Naholo moving from the right wing to the left in the absence of the injured Rieko Ioane, and Ben Smith moving from fullback to the right wing. The reserves bench, which had such an impact in the second half as the All Blacks scored five of their six tries to easily finish over the top of the Wallabies after a tight first half last Saturday, remains the same, as does the pack, with tighthead prop Owen Franks to play his 100th test. It means there is no place for wing Nehe Milner-Skudder, a possibility to replace Ioane on the left after suffering a hamstring tear which will keep him out for two weeks. Milner-Skudder, on the comeback from injury himself, played for Manawatu last weekend but the selectors have decided to go for the 21-year-old Barrett instead. It will be Barrett's sixth test. The selectors decided to rest Barrett last weekend to allow him to reflect on his development and there is little doubt his job will be slightly easier in the absence of the injured Wallabies fullback Israel Folau. However, the need to improve on last weekend's performance will be driven home this week by coach Steve Hansen as the Wallabies attempt to break their hoodoo at Eden Park, where they haven't beaten the All Blacks since 1986. Another home win would be the Wallabies' 18th consecutive defeat against the All Blacks there and they would concede the Bledisloe Cup again; extending their winless drought in the series which goes back to 2002. Hansen said: "The team is fully aware that it has the opportunity to close out the Bledisloe Cup series on Saturday. In saying that, we know that there'll be a massive response from Australia following their performance last week. Not only are we excited by this challenge, but we're looking forward to responding ourselves with a better performance." Hansen also paid tribute to Franks. "While last week was a special occasion for Sammy Whitelock, this week it's Owie's turn to join that special club," he said. "He has started 90 of his 99 tests to date, which is an incredible achievement."